Massey researchers to investigate beehives improving learning outcomes in schools. 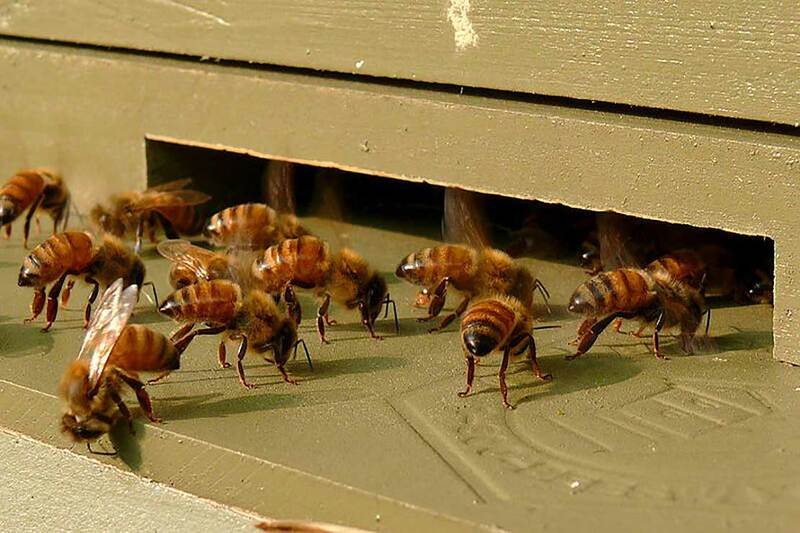 Could beehives in schools improve learning outcomes for children? This is the question that Massey researchers are keen to answer with a pilot project in Wellington. The project sees a colony of bees installed in an observation hive, known as an Apiscope, in Avalon Intermediate School and researchers will look at the potential of the hive to create authentic learning experiences across many areas of the curriculum. Associate Professor Tracy Riley of the Institute of Education and Distinguished Professor Anne Noble of the College of Creative Arts are collaborating on the innovative project and travelled to France this year as guests of the French organisation Abeille etc… to visit schools with the hives installed. The 10-year-old project is the brainchild of University of Orléans physicist Dr Jean-Pierre Martin who has overseen the installation of 80 Apiscopes in schools throughout France. Dr Martin and Professor Noble initiated the New Zealand Apiscope project while working together on an exhibition project in France three years ago. “We know from Jean-Pierre’s work in France and anecdotally that children of all ability levels, gifted and those with learning challenges, enjoy the bees. I want to document how that works and how teachers use it to meet different needs. We can learn what inspires children’s’ curiosity and use their questions and experience of wonder as learning opportunities,” says Dr Riley. Bees unveiled at Avalon Intermediate School last week, (left) Dr Martin, Genesis Kiliata and Kristan Isaako, Professor Noble, Mr Hastie, Dr Riley. 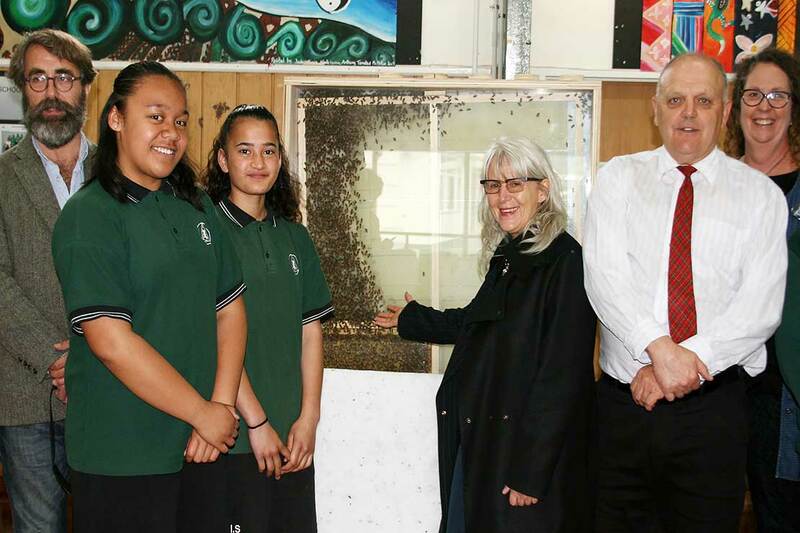 Avalon Intermediate School is the second school to have a hive installed and welcomed with a pōwhiri last Friday. Dr Riley and Professor Noble will support and observe how the teachers at Avalon Intermediate use it and the impact it has on the children. Newlands Intermediate School was the first Wellington school to host a hive and principal Angela Lowe says it has changed their lives. “ It was a catalyst for change. We became environmentally focused, more science focused and it also developed intangibles like empathy and the ability to be carers. “The class that has the Apiscope in it is very emotionally involved. The kids are the experts and they are very proud. We love the ‘I wonder’ questions like ‘what will happen next?’, ‘what are the bees thinking?’,’where will we get a queen from?’. The kids are filled with wonder, awe and excitement,” she says. The Apiscope at Newlands Intermediate has initiated the development of beehives, a worm farm and organic gardens, bee-friendly sprays, bee-friendly plants and a new found respect for gorse and children who are very calm around bees. “At harvest honey time, there are about 80,000 bees around the school and we have very calm children- last year we only had three stings,” Ms Lowe says. The New Zealand France Friendship Fund paid for Professor Noble and Dr Riley to travel to France and it is hoped the fund will assist further teacher exchanges in the future. Dr Martin is in New Zealand until November as a guest of Massey University and will work with Professor Noble and Dr Riley on this project to investigate the potential of beehive observation to facilitate curiosity-led learning by focuses on living systems. See a bee song from Avalon Intermediate here.